I am truly loving this card. First, I was a bit intimidated by this stamped image. As you can see from the pictures below the Image is like a collage. I really had no clue what to do with it. That's probably the reason why it has been in a folder for the last two years. This stamped Santa image was given to me about two years ago by my mom. I believe it is from a Stampin' Up stamp. Thanks to one of the most recent challenges on Simon Says Stamp Blog, I pushed myself to come out of my comfort zone. The challenge that they are hosting which inspired me to finally use this Santa image is called About A Face. 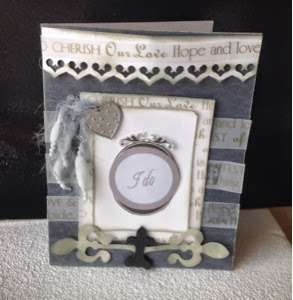 This Gray and white wedding card is the result of an inspirational card challenge called Sweet Sunday Sketch Challenge. The awesome sketch that was provided is shown below. 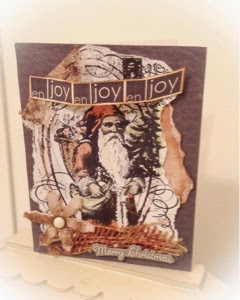 This shaped card was inspired by challenge called "Start from scratch challenge" over at Simon Says Stamp Challenge Blog. The base of the card in which the hot air balloon rests was made using water colors on white card stock. 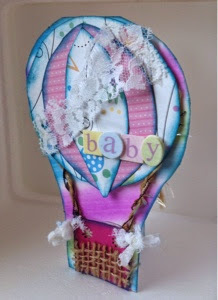 To make the hot air balloon itself, I have made a tutorial on my blog. After creating the hot air balloon, it was glued the card base closer to the fold on the left side. 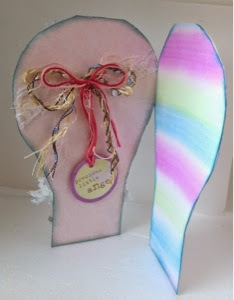 To shape the card, cut around the whole balloon embellishment except on the left side of the balloon where the fold is. I like the card but it needs some improvements. Hopefully the next one will take on a little more of a professional looking card.